American Islamic College held its First Annual Chaplaincy Workshop for Non-Muslim Chaplains serving in multi-faith settings, such as hospitals, military, schools, and prisons. After a delicious breakfast, President Dr. Ali Yurtsever gave encouraging introductory remarks to launch the program. Jawad Qureshi, AIC’s Professor of Arabic and Islamic studies, followed with an introductory survey of Islam. AIC’s adjunct of Psychology, Hooman Keshavarzi, then gave a presentation that covered the scenarios related to counseling and pastoral care to patients with mental health. In doing so, he covered topics, such as suffering and death in Islam. Saleha Jabeen, a Healthcare Specialist in the US Army Reserves, offered anecdotes and her personal journey in interfaith studies and dialogue as a foundation for her current role and interests. She mentioned the importance of communication and open dialogue as a way to break the ice and build a bridge. “Just ask,” she said, when talking about religious and cultural sensitivities present in working with patients. After lunch, Sheikh Kifah Mustapha spoke on “End of Life and Funeral Proceedings.” His talk was thorough, and he covered a number of interesting topics, such as, organ transplants, abortion, vegetative states, suicide, etc. He concluded his talk with funeral preparations and the Islamic perspective on burial and wakes. To conclude, Imam Khalid Bilal, a chaplain in the Cook County jail, discussed the difficulties present in securing accommodations for Muslim inmates. He offered tips on how to provide support and resources for those in jail and for those released. 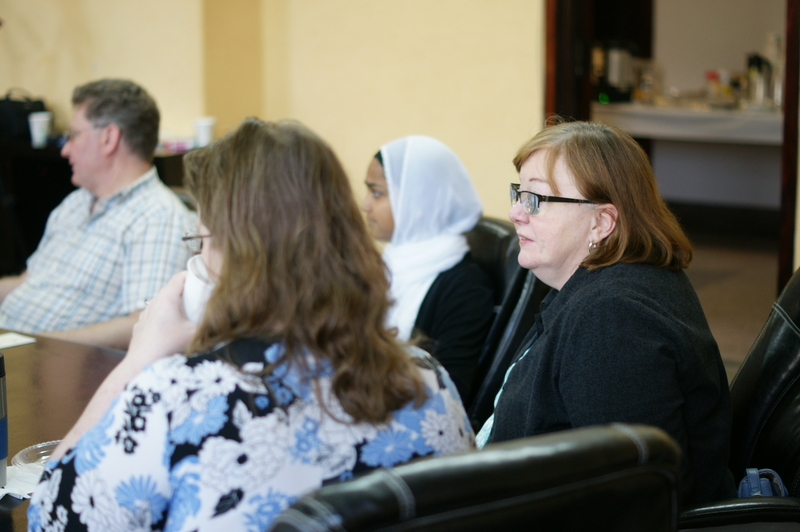 The workshop provided an in-depth sharing of Islam, presented nuances in perspectives within Muslim observances, raised theological questions related to suffering, sickness, and death, and discussed some practical applications for interactions between chaplains and their Muslim constituents. There are a number of chaplaincy sites that serve multi-faith contexts, like hospitals, schools, prisons, and the military. There are many Christian and Jewish clergy and/or practitioners who serve in chaplaincy roles that find themselves attending to the needs of one who identifies as Muslim. Thus, this cultural and religious sensitivity training is offered to all chaplains working in a multi-faith setting who could benefit from some training and resources related to Islam. Jawad Anwar Qureshi is assistant professor of Arabic and Islamic Studies at the American Islamic College. He is a doctoral candidate in Islamic Studies at the University of Chicago’s Divinity School. His qualifying exams were in Qur’anic studies, Sufi literature, Islamic revival and reform, and contemporary theories for the study of religion. His dissertation explores debates amongst 20th century Syrian ‘ulama on issues related to law, ethics, tradition, and politics, focusing on the exchanges between Syria’s most prominent religious scholar in the last half of the 20th century–Said Ramadan al-Bouti (1924-2013), rahimahu Allah–and his interlocutors. Jawad also has degrees in religion from the University of Missouri-Columbia (BA) and the University of Georgia-Athens (MA). His training in the academic study of religion is complemented by years of sustained traditional Islamic studies in America and abroad. In Syria, he studied a variety of Islamic sciences privately under ‘ulama in Damascus and Aleppo for four years, covering theology, jurisprudence, legal theory, Sufism, hadith nomenclature, hadith, and Qur’anic exegesis, among other sciences. Jawad’s research interests pertain to the Islamic intellectual tradition, the ways in which it is constituted, contested, and developed, and the ways in which it intersects with public life. He has contributed a chapter to State and Islam in Baathist Syria: Confrontation or Co-Optation? (Scotland: University of St. Andrews Centre for Syrian Studies, 2012), titled: “The Discourses of Damascene Sunni Ulama during the 2011 Revolution.” He has also contributed entries to The Oxford Encyclopedia of Islamic Law and The Oxford Encyclopedia of Islam and Politics. He is also preparing a critical edition and study of a number of kalam and Sufi texts by the Ottoman Damascene scholar ‘Abd al-Ghani al-Nabulusi (d. 1731). Jawad is a Fulbright and Fulbright-Hayes (DDRA) awardee. At AIC, Jawad teaches courses on Qur’anic and classical Arabic, Qur’anic studies, Sufism, Muslim revival and reform, as well as methods and theories in the study of religion. Hooman Keshavarzi is a Licensed Clinical Professional Counselor, holds a Masters of Clinical Psychology and a Bachelors of Science – specialist psychology track/minor in Islamic Studies. He is currently an Adjunct Professor of Psychology at Argosy University Chicago, American Islamic College, Hartford Seminary, instructor of psychology at Islamic Online University and founder/director of Khalil Center – a community spiritual & mental wellness center. He is also a fellow at the Institute for Social Policy and Understanding at the Global Health Center, conducting research on topics related to Muslims and Mental Health. Hooman Keshavarzi is a national public speaker and trainer currently serving as a Clinical supervisor of graduate students of clinical psychology at the Village of Hoffman Estates (DHS). He also delivers seminars on specialized topics around multiculturalism and psychology. Sheikh Kifah Mustapha is the Imam and Director of The Prayer Center of Orland park. He is the appointed representative for the Ministry of Religious Affairs in Lebanon (Darul Fatwa) on behalf of the Lebanese Community in the USA. Sheikh Kifah Mustapha serves as the chairman of the Illinois Council of Imams and Scholars and the chairman of the Quran Institute of Chicago MAS. He also served as a member on the Advisory Boards of The Mission and Spiritual Care for Advocate Health Group in Illinois, the Council for the Center for Faith and Community Health Transformation, and the American Islamic College in Chicago. Sheikh Kifah Mustapha is a recipient of the CAIR-Chicago Mobilizer Award, Arab American Business & Professional Association’s Outstanding Leadership Award and the Lincoln Land Legends’ Scholars for Dollars Award. He is an experienced public speaker and an active participant in interfaith relations. Sh. Kifah has a bachelor in Sharia from American Islamic University in VA, USA, a diploma of Sharia (Master’s Program) from Beirut Islamic University (Azhar Beirut) in Beirut Lebanon, and a diploma of Islamic Studies (Master’s Program) from Global Theological Foundation in IN, USA. Saleha Jabeen is a native of India and has lived in Chicago, Illinois since 2005. Saleha received her Bachelor of Arts in Business and Economics at North Park University and a Masters in Theology (Interreligious Dialogue) at Catholic Theological Union, Chicago. Saleha serves on the board of MyJihad, Inc., a public education campaign launched in Fall 2012 “taking back the word” and combatting Islamophobia. Saleha has also served as an interfaith chaplain intern at Northwestern University, Evanston. Earlier this year Saleha has joined the U. S. Army Reserves to serve as a Healthcare Specialist. Continuing on with her education Saleha Jabeen is pursuing M. A. in Counseling Psychology at Trinity Christian College, Palos Heights. For future endeavors, Saleha hopes to serve the human community as a Licensed Clinical Professional Counselor. Saleha Jabeen enjoys cultural religious and diversity, for food and friendship. She currently resides in Skokie, Illinois. Chaplain Khalid Bilal has been a volunteer prison chaplain for over twenty years. He is a paralegal and BS legal student supplementing classes at Wilbur Wright College and currently doing his internship at Chicago Advocate Legal, a non- for-profit low cost legal clinic. Furthermore, Chaplain Khalid was a property manager at Heartland Alliance, a non-profit that seeks to end poverty by working in housing, healthcare, jobs and justice and currently an active volunteer with the Chicago Coalition for the Homeless.